WASHINGTON (AP) — Unlike the president, Robert Mueller hasn’t uttered one word in public about his Russia investigation in the year since he was appointed special counsel. And that is rattling just about everyone involved. What’s he up to? When will he bring the probe to an end? He doesn’t have to say, and he’s not. A year into the investigation, the stern-looking prosecutor is everywhere and nowhere at the same time. In that time, the breadth and stealth of investigations surrounding President Donald Trump have unsettled the White House and its chief occupant, and have spread to Capitol Hill, K Street, foreign governments and, as late as last week, corporate boardrooms. With lawmakers eying midterm elections and Trump publicly mulling whether he will sit for an interview with Mueller, Republican calls are growing for the special counsel to end his investigation. Vice President Mike Pence and others have said it publicly. GOP lawmakers insist they’ve seen no evidence of collusion between Russians and Trump’s 2016 election campaign. The longer the investigation runs, the more those calls are likely to amplify. Mueller is investigating Russian interference in the election, whether Trump’s campaign was involved and possible obstruction of justice. And by the standards of previous special counsel investigations, his actually has so far gone fairly quickly. Since Mueller was appointed on May 17, 2017, his office has charged 19 people and three Russian companies. Among those charged are four Trump aides, including former national security adviser Michael Flynn and ex-Trump campaign chairman Paul Manafort. The probe has also ensnared countless Washington insiders who have been called to testify or found themselves under scrutiny, including lobbyists and foreign representatives who may have illegally sought to influence the administration. Large corporations like AT&T and Novartis have been contacted by Mueller and caught up in an offshoot investigation into Trump’s longtime personal attorney Michael Cohen. The companies acknowledged last week that they paid Cohen for “insight” in the early days of the Trump administration. The president’s lawyers have rushed to fill that vacuum, recently suggesting they’ve been told Mueller won’t indict Trump and couldn’t force the president to comply with an interview. Personal attorney Rudy Giuliani suggested that a recent conversation with Mueller’s team led him to believe the special counsel, citing a Justice Department opinion, had ruled out the possibility of trying to indict a sitting president. But while he calls for an end to the investigation, Trump’s own indecision over an interview remains the most visible impediment to a speedy conclusion of at least one key part. Giuliani said Mueller has indicated to the legal team that he’s “pretty much finished,” with the exception of the president’s interview. “As far as we know, we’re basically the last witness,” Giuliani said. Beyond that, the endgame remains unclear. A final report from Mueller could go to Congress — a move that would become more significant if Democrats win control in this year’s elections. It’s unclear how much insight the Trump legal team has into Mueller’s timing. As in most major investigations, his office does not leak, and his spokesmen decline to comment on nearly every news story. Mueller is barely even photographed — forcing news outlets to run the same photos and videos over and over again, of Mueller on Capitol Hill or heading to work. Instead, the few public glimpses into the special counsel’s work come from witnesses who are interviewed, attorneys and court filings made in the publicly filed criminal cases. It’s also unclear how important the issue is to voters back home. Sol Wisenberg, who conducted grand jury questioning of President Bill Clinton as deputy independent counsel during the Whitewater investigation, said public perceptions of Mueller’s probe wax and wane, filtered through the viewpoints of prosecution supporters and opponents. 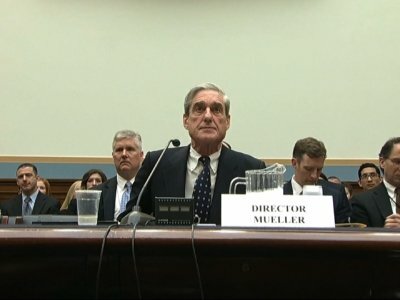 Mueller’s detractors would argue that the cases have largely involved false statement allegations divorced from the central Russian collusion question, Wisenberg said, while supporters will point to the indictments to prove the special counsel has uncovered criminal conduct deserving of his appointment. Democratic leader Chuck Schumer said Thursday on the Senate floor: “I would say to the president it’s not a witch hunt when 17 Russians have been indicted; it’s not a witch hunt when some of the most senior members of the Trump campaign have been indicted.” Schumer’s numbers are slightly off; the indicted include 13 Russians, not 17.